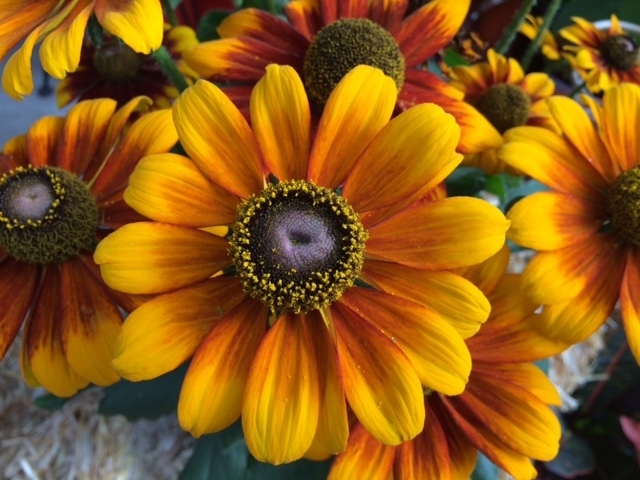 Echter's Garden Talk – Page 4 – Posts from one of our experts with timely information for you to be more sucessful in gardening and creating beauty in your yard. 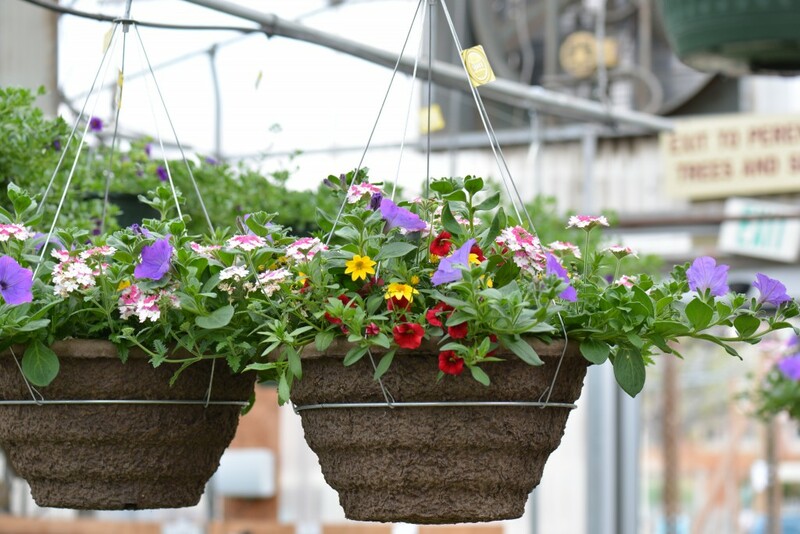 A basket of shade-loving plants could include pansies, compact or trailing coleus, bacopa, begonias, fuchsia, and traditional impatiens. For a quick combo, try 3 Illumination begonias and 3 white bacopas. 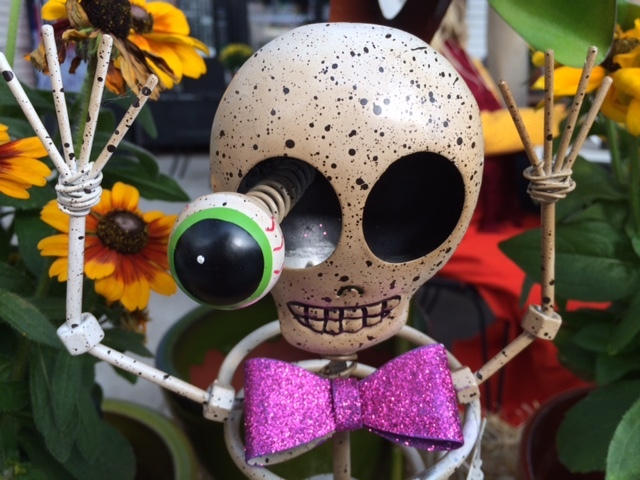 A word about feeding your plants – Yes! 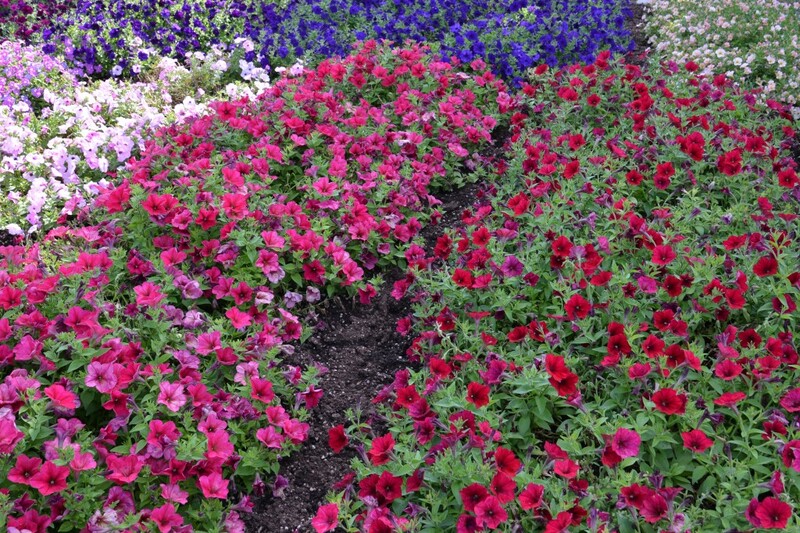 We’re asking our annuals to entertain us with beautiful blooms all summer long, through any sort of weather or challenge that comes their way. They can’t do that without regular fertilization. Try Jack’s Classic Blossom Booster for the majority of your flowering plants, outdoors and indoors. 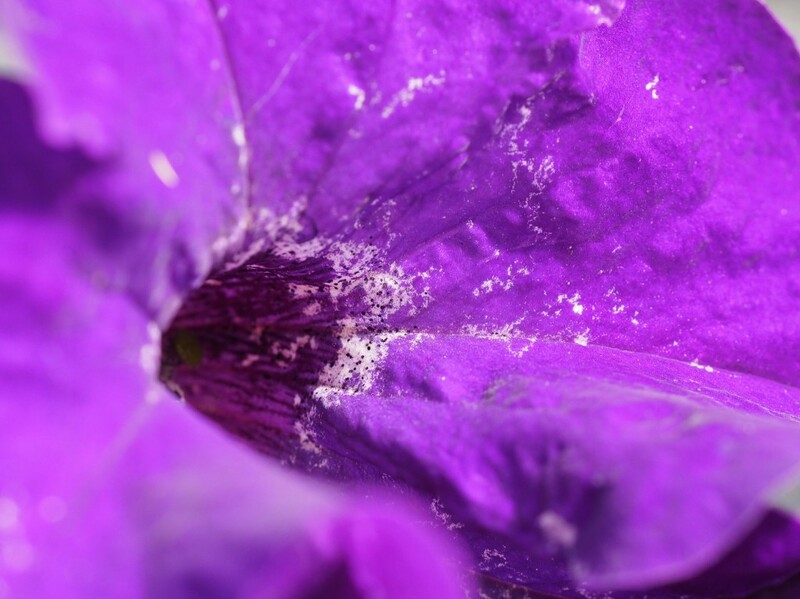 Petunias prefer a special diet, so try Jack’s Classic Petunia Feed. Follow the instructions on any fertilizer you select. There are helpful tools like Season Starters that can be used to warm the ground earlier than traditional planting would allow. They should be set up for 7-10 days to warm the soil, before they are planted with your seedlings. Once planted, the plant protectors act as insulators against cold temperatures, much like a mini greenhouse. Generally, Season Starters can give you a jump start by several weeks. Set them up about April 15 and you can plant inside them a week later. Have you ever gone to the grocery store and said oh my 4 dollars for 4 sprigs of basil. Well there is an easy way to get what you want and help you save a bit of cash, as well. Not only will starting your vegetables, herbs, and flowers from seed help the pocket book, it is a wonderful thing for the whole family to watch a plant grow from a tiny seed, and there is nothing more rewarding than harvesting a crop that you grew. The first thing to do is determine where you plan to plant your garden outdoors. Most vegetables require full day sun to mature properly. There are only a few that will grow in partial sun, mostly leafy greens. Knowing your available light will determine what you can successfully grow. It’s also a good idea to have a basic soil test done to determine the big three nutrients available in your soil – Nitrogen, Phosphorus and Potassium. The information will let you know what amendments may be needed. Read the seed packet. There should be a description of plant characteristics, giving you an idea of what to expect. Look for information about the preferred season to grow, seed sowing depth, days to germination, and days from transplant until harvest. There should also be information about preferred light and whether or not the seed will do best if started indoors or directly sown into the outdoor garden bed. Often there is information about the disease resistance of the variety, too. In the case of tomatoes, there should be a notation of the plant being determinate or indeterminate. Some seed companies provide additional information inside the packet. If you prefer to use organic seed, look for the USDA organic symbol on the front of the packet. You won’t find GMO seeds at Echter’s. 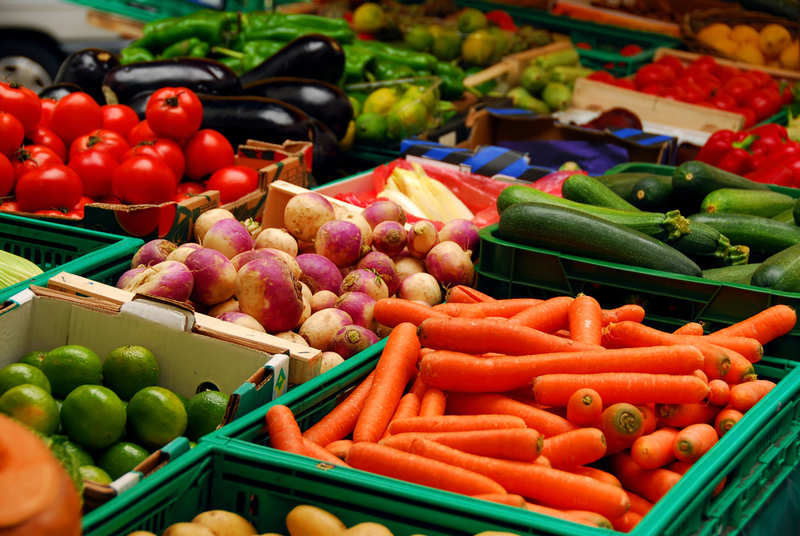 In fact, GMO is primarily used on commercial farms and is rarely seen in the garden center or home garden. Why is the information on the packet important? All of that information allows you to select the right varieties to grow in your climate and those that suite your both your needs and taste buds. Is the plant warm season or cool season? This will help you decide when to plant said crop for instance things like spinach, kale, chard, Brussels sprouts, are all cool season crops. Meaning you can start those 4-6 weeks before the average last frost. Whereas things like peppers, tomatoes, zucchini, need to be started after the last frost. I know it can be confusing but on most seed packets you will have that information of cool season or warm season right on the front. What is days to emerge? This is how many days it will take that seed to as we say crack or germinate. It is when you will see the first sign of life the first little showing of green. How many days until harvest? This means how many days it will take from the time you plant in the ground or container, till you will be able to harvest said crop, or see blooms on flowers. Should I start my seeds indoors our outside? 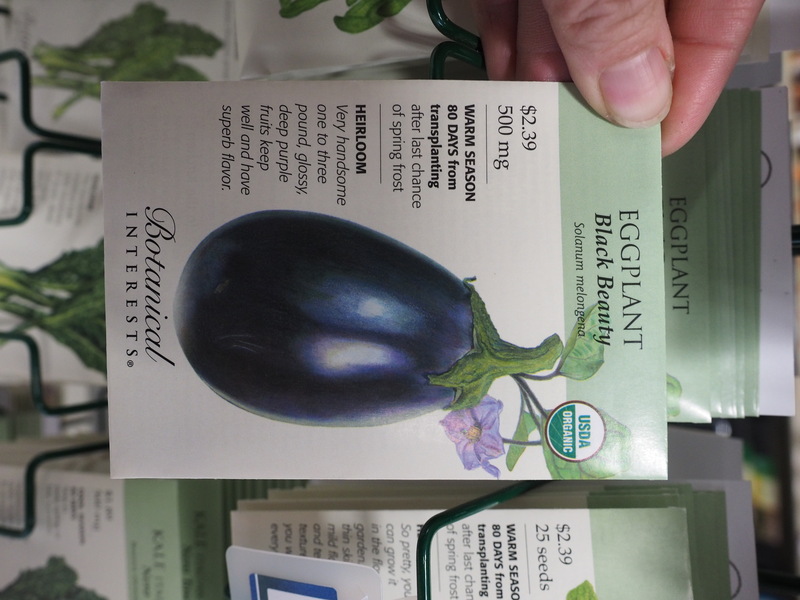 Most seed packets will recommend whether to start inside or outside. For instance it is a good idea to start your tomatoes and peppers inside since Colorado has such a short growing season. Whereas things like corn, leafy salad greens and root crops like carrots prefer to be directly sown into the ground. Now that you can identify what and when to plant there is no stopping you! You will have a few other needs to get started. 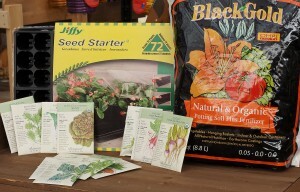 You’ll need seed trays and seed starting mix or Jiffy pots. It’s also helpful to have some plant labels so you can note the date the seed was sown and the variety. A heat mat is helpful, particularly if your home temperature is on the cools side. It will heat the soil evenly, providing optimal conditions for seed germination. Humidity domes can help keep the necessary moisture around the seed to aid in germination. If the light on your windowsill is inadequate, try adding indoor grow lights. Most are energy efficient and you’ll use them for years to come. 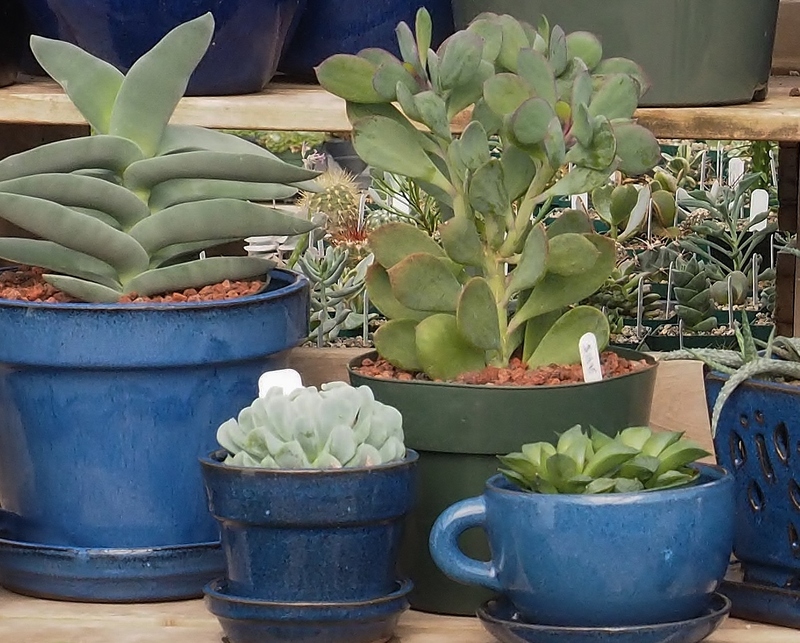 If you are starting indoors it will be important to have additional pots on hand, usually 3”-4” diameter. Once seedlings have established, they will need to be potted up until it is time to transplant outside. It’s a good idea to keep the empty seed packets for a couple of reasons. 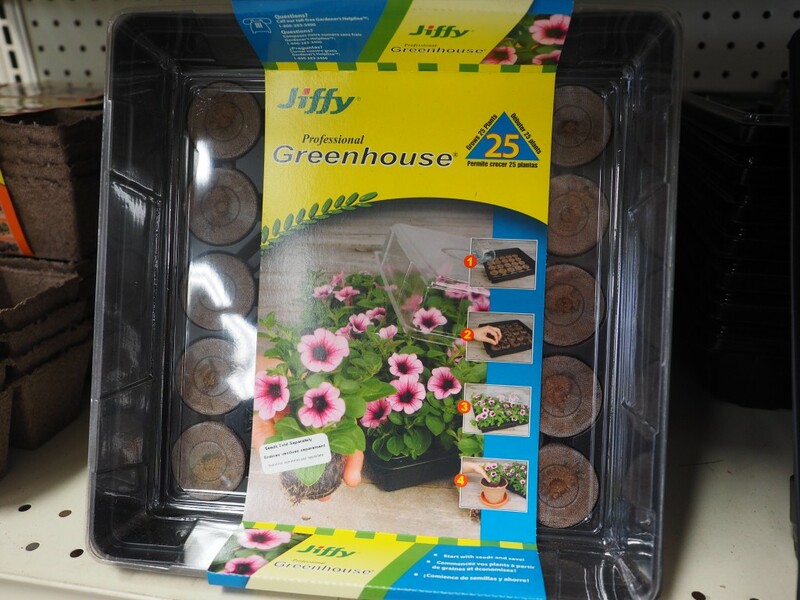 The first is that it can be a few months before your plants reach maturity. In that time, it’s easy to forget details that may be handy to know as harvest time approaches. The second is that you may find out you love that variety and having the seed packet will help you remember what to buy the following season. It is important to remember that gardening involves some trial and error, and there is no fool proof method. Mother Nature has her own ideas sometimes. It never hurts to try new things. If you are successful you will not only reap the benefits of tasty veggies, aromatic herbs, and beautiful flowers, but the confidence that, yes, you can grow something from a seed. For some, Valentine’s Day is a day is greeted with enthusiasm. For others, angst might be a better description. For the latter, take a deep breath. We’ve been helping people choose that perfect gift for 55 years. In that time, we’ve picked up a few tips that may help rid the day of anxiety and replace it with anticipation. 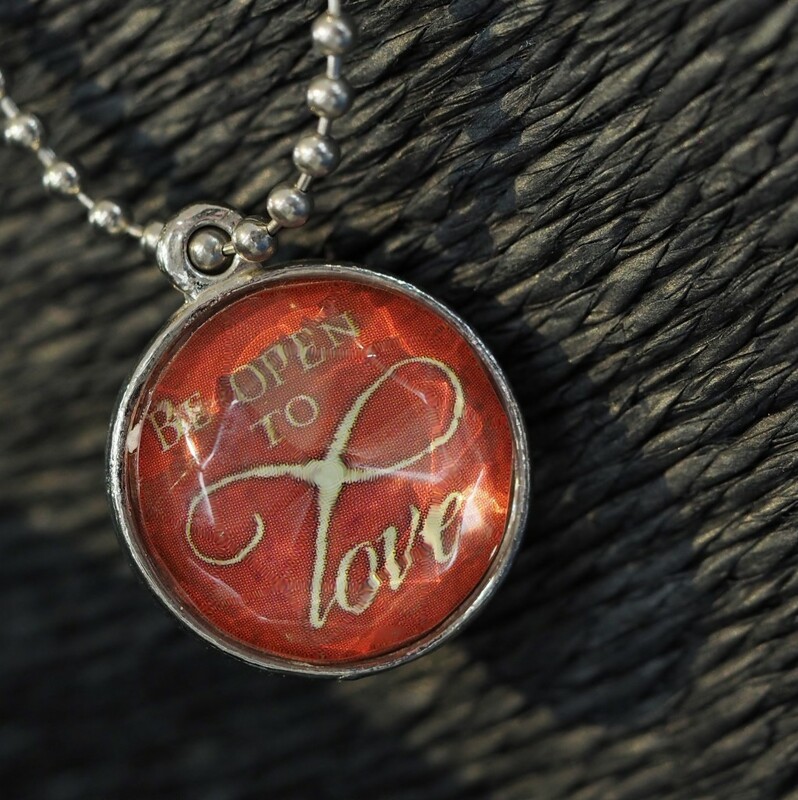 Valentine’s day is an opportunity to tell our sweethearts and loved ones just how much they are loved. Gifts and cards are merely tokens of our affection for one another. Chances are, your sweetie would be thrilled just to have your undivided attention for awhile. After all, the best part about Valentine’s Day is the also the simplest, sharing your love. First things, first. The easiest way to enjoy the day is to plan ahead. Most of the anxiety occurs when we procrastinate. Make a list of those you wish to celebrate on Valentine’s Day. My list includes parents, sisters, brother, children and some family members I don’t often get to visit, and my sweetheart, too. Second, decide how you are going to honor these people on this special day. For my siblings, parents and out of town family members, I like to make a point of calling and actually talking with them. No texts. No e-mails. No tweets or online messages. A real conversation, about what’s happening in their lives is as much a gift to me as it is thoughtful to them. Gifts for your sweetheart should be thoughtful, with care to what you know they will enjoy. For instance, giving flowers and plants is traditional. A little thought about favorite flowers or colors makes it extra special. My mother, for instance, prefers plants over cut flowers because she can enjoy them for a long period of time. Her favorite color is blue, so a blue pot or blue bow tailors the gift to her tastes. Have fun with your gift giving. Perhaps a cactus planter with a note that says “I’m stuck on you” would make your sweetheart smile. With that in mind, here are a few ideas. 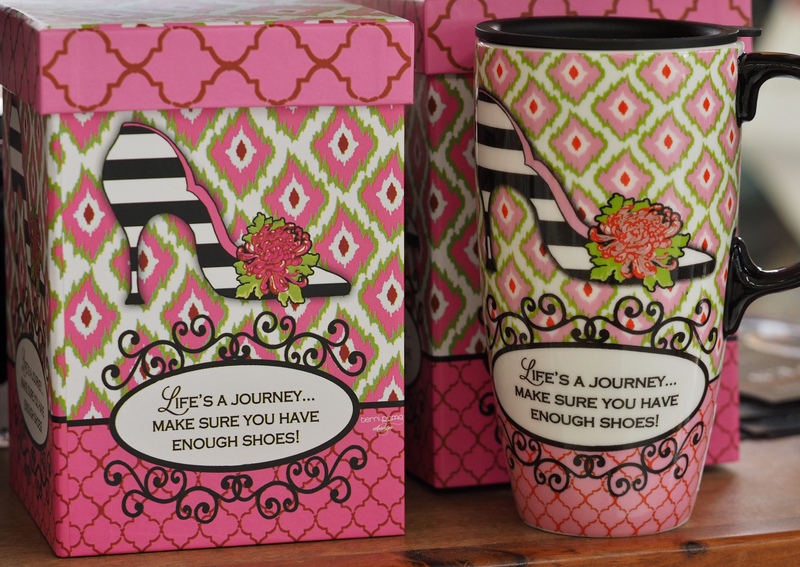 Boxed mugs, insert a Starbuck’s gift card and/ or a gift card for her favorite shoe store. Light up the night for the light of your life. (yes, I know it’s corny) These glass butterfly night lights come in several colors. 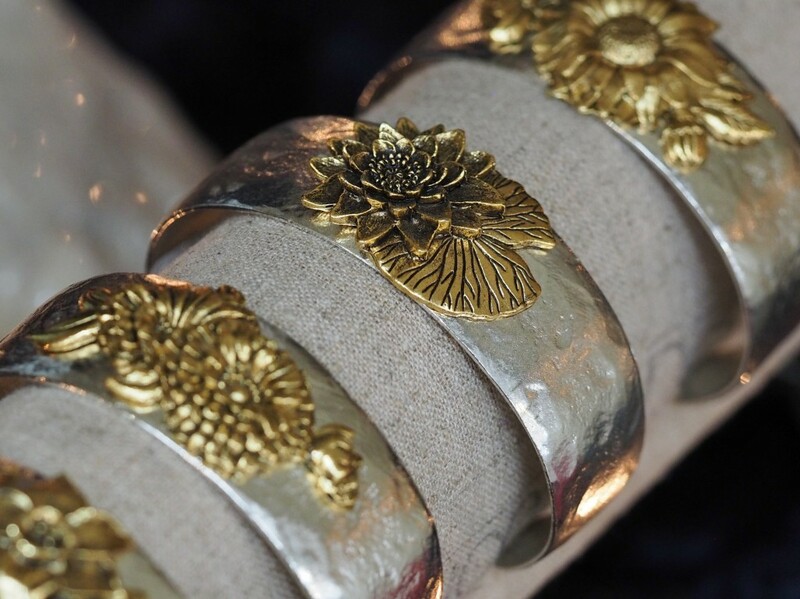 Floral cuff bracelets, each flower represents a birthday month and is engraved on the back. 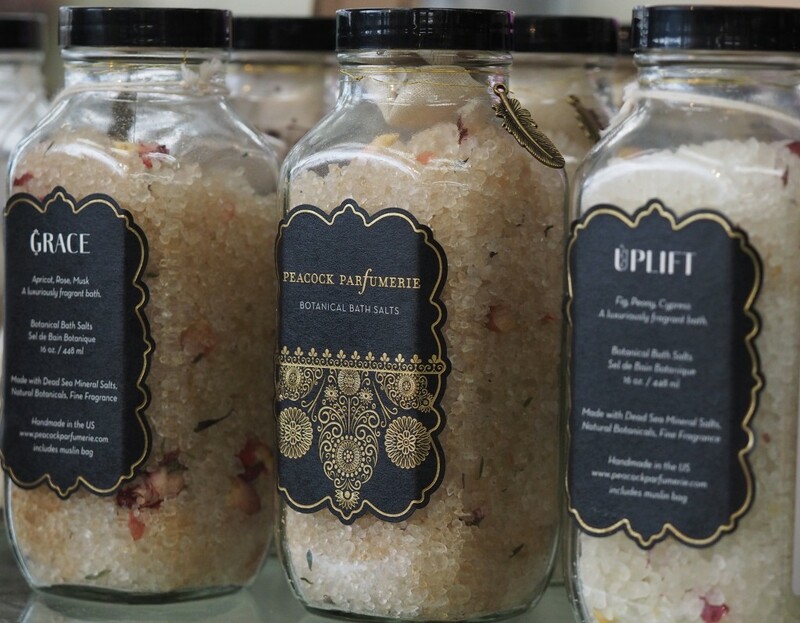 Encourage a little relaxation with specially designed, aromatherapy bath salts. Add a few candles and a note that you’ll take care of the kids. 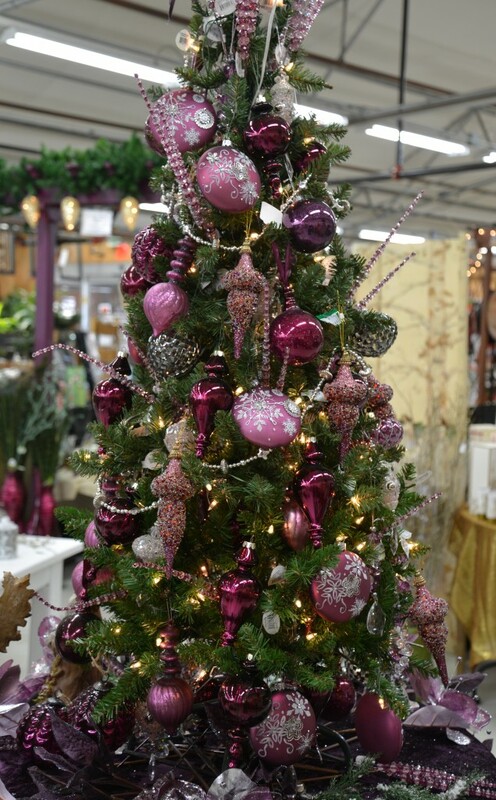 The Christmas tree has been the centerpiece of the home through the holidays for several hundred years. What began in Germany in the 1500’s has evolved into a time honored tradition that has spread across the globe. Today, there are many choices available to suit most anyone’s decor and style. Typically, these choices are centered on three types of trees; permanent trees, fresh cut trees and living trees. Each has it’s benefits, so how do you choose? Here’s some of the basic information to making the most of your holiday tree. Permanent trees require little maintenance and can be enjoyed for years. Most are hinged, making assembly a simple matter of sliding each section’s center post into the next, then fluffing out the branches. The fluffing is the key to making your tree look full and lush look. In most cases, permanent trees are pre-lit. Traditional bulbs come in both clear and assorted colors. They have a softer look than the newer LED lights. 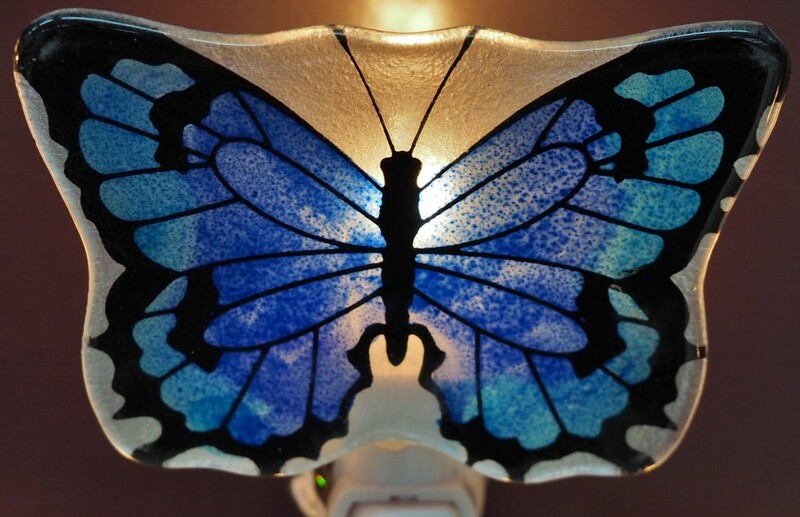 LED lights are energy efficient and long lasting, but are significantly brighter than their traditional counterparts. In both types, the lights will remain lit as long as the circuit isn’t broken. That means if one light goes out, the rest will still remain lit, unless you remove the bulb from the strand. Permanent trees can be found in an array of colors from black to red, to purple. However, most of us will choose the life-like green trees. The construction quality of permanent trees is the key to their durability and determines the years of enjoyment the tree will provide. Many newer styles incorporate injection molded branches which mimic living trees with greater accuracy. It’s a good idea to have a bulb tester handy as your tree ages. Most of them will last 10 years or longer, which means you may need to replace a bulb or two over its lifetime. Fresh cut Christmas trees are the preferred tree for most people. Their fragrance fills our homes and delights the senses. There are quite a few types of fresh cut trees available. We stick to those we feel perform best in our dry winter climate. 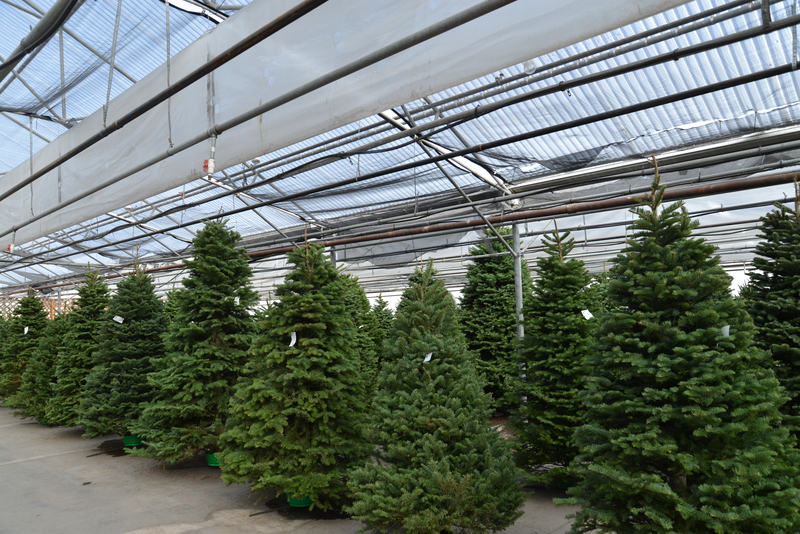 Fraser Fir, Noble Firs, Nordman and Douglas Fir are some of the most popular choices. Frasers and Nobles hold their needles longer and have sturdy branches to hold larger ornaments. For a little something different, try a Princess Pine. The average humidity in Colorado homes is 30% or less. That means the needles don’t retain their moisture well. There are a few things we can do to help. First, give your tree a fresh cut, removing two inches from the bottom. then place the tree in a stand that holds adequate water. The larger the water reservoir, the less likely your tree is to run out of water and dry out. You can also apply products that reduce the transpiration rate of the needles. These are sprays like Wilt Stop and should be applied outdoors or in a garage before bringing the tree indoors to its final destination. Once your tree has a fresh cut, is in place and water fills the reservoir, allow your tree to stand for a day or so to insure it is taking up water before decorating. This is important because no one wants to remove the decorations because the tree needs another cut or isn’t taking up water. Keep water in the reservoir at all times. Once it runs dry, the tree may stop taking up water. Products like Keeps It Green can aid in the preservation of your tree through the season. Please read instructions on anything you plan to add to the water, particularly if you have young children or pets who may attempt to drink water from the stand. If you are unable to prevent them from gaining access to the stand, stick to using plain water. Decorate your tree with lights appropriate for indoor use. Older outdoor lights are too hot and can easily result in fire. Leave your lights on only when there is someone present to monitor them. Remember to follow instructions. Most light strands will tell you not to link more than 3 strands, end to end. Safety first. The average 6 foot tree takes about 6 years to grow. Christmas trees are grown as sustainable crops, meaning farmers replant their tree fields for future holiday’s use. If you don’t like the idea of cutting down a farmed tree, then perhaps a living Christmas tree is the choice for you. 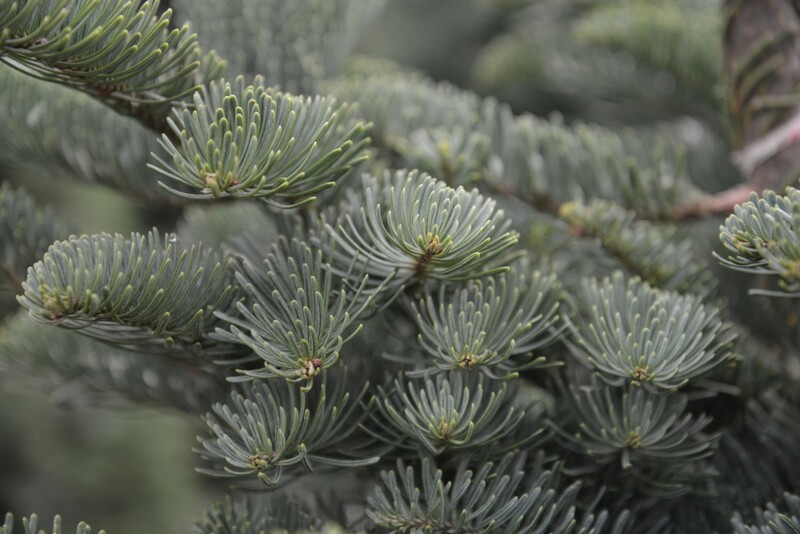 Living Christmas trees are beautiful and can become a wonderful tradition that promotes giving back to nature. They do have some special needs in order to preserve them. Live trees aren’t meant to live in our indoor temperatures for an extended time. Keeping them indoors interrupts their winter dormancy. In order to preserve their dormant period, they shouldn’t be indoors for more than 10 days. They can be kept potted, outdoors in a protected area until the ground can be worked for planting, following their use indoors. When trees are potted, they are no longer part of nature’s care. It’s up to you to look after them until they can be planted and become an established part of the landscape. This means you’ll need to water them when their soil dries about half the depth of the pot. Don’t fertilize them. Fertlizer stimulates growth that would be damaged in the next freeze. Larger potted trees are a bit easier to maintain, simply because the size of their pots provides greater soil volume to protect the roots from freezing. Raised above ground, there is a risk of the root system being damaged from greater exposure. It’s helpful to water them just before a freeze, as this acts as insulation to roots. 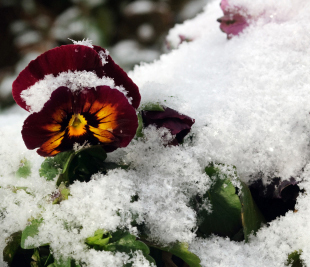 Well hydrated plants are less susceptible to dehydration from winter winds and arid cold spells. Pots can be wrapped in bubble wrap to provide a barrier to the cold, as well. Remember to water them and keep them out of dry winter winds. Fall automatically brings to mind changing colors and inspires us to change out our tender summer annuals for new shades. Traditional pansies and mums are a classic seasonal adornment to bridge the gap from summer to winter, but have you tried combining them with other late-season color? Try some of these ideas and you’ll have containers you’ll love through to Thanksgiving. Most of these are perennials, so they can be pulled out and planted in the ground when you are ready to change out for holiday decorations. 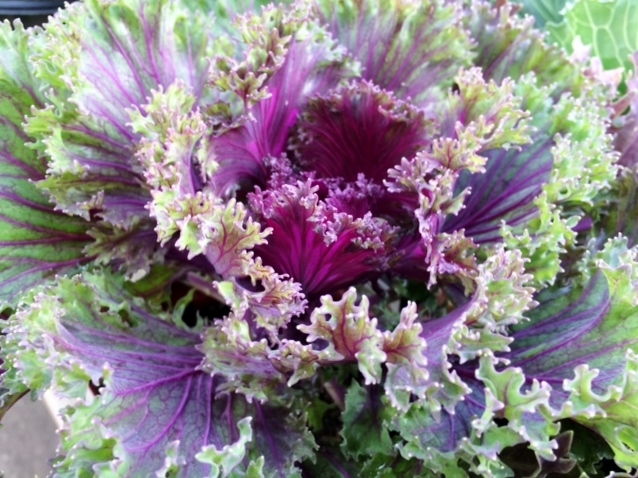 Ornamental Kale/Cabbage- most commonly found as large rosettes in shades of green, icy blue-green, purple, pink, or red, kales are long-lasting and easy to maintain. Annual. Sedum- covers a wide range of colors, textures, and heights. 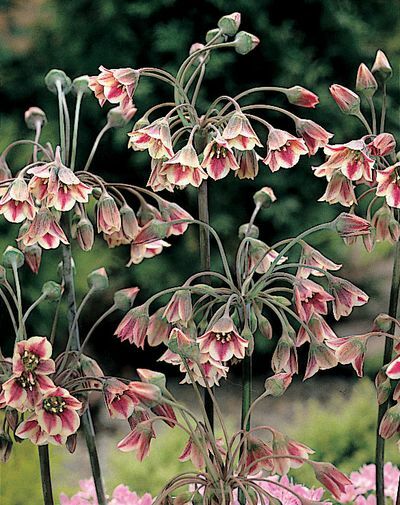 Some varieties are only a few inches tall, while others such as Autumn Joy can reach 2 feet. Mixing varieties in the same container can produce an amazing results—a tall, billowing sedum in the back of a pot can be nicely balanced by ‘Dragons Blood’ spilling off the front in shades of red (or ‘Angelina’ for yellow). Many varieties have quarter-size fleshy leaves that shift in tone from cool blues to fall tones. Euphorbias- flower vividly in the spring and have red/orange/yellow leaves as fall sets in. Foliage texture can be rigidly upright to wispy and delicate. Some have a full & fluffy look, while others are more airy. 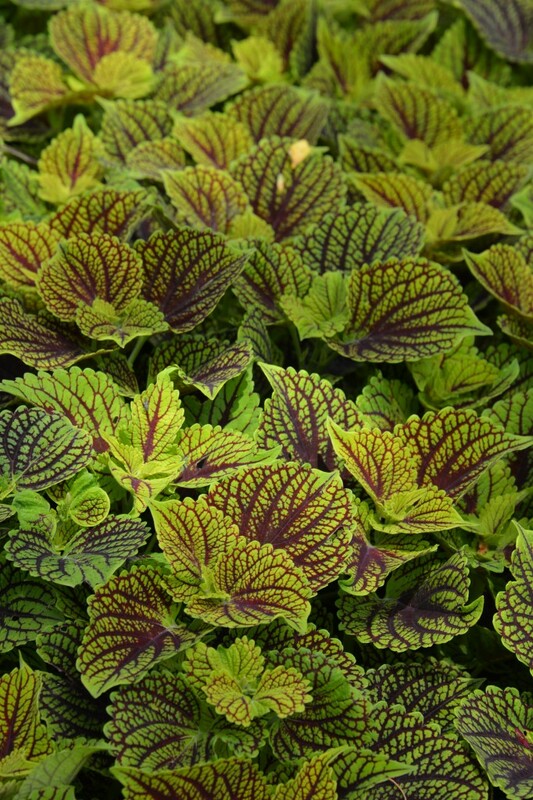 Heucheras/ Coral Bells – Available in a wide range of fall colors from deep, rich purples to caramel. Green varieties blend to reds and purples as the season progresses and add a sophisticated flair. 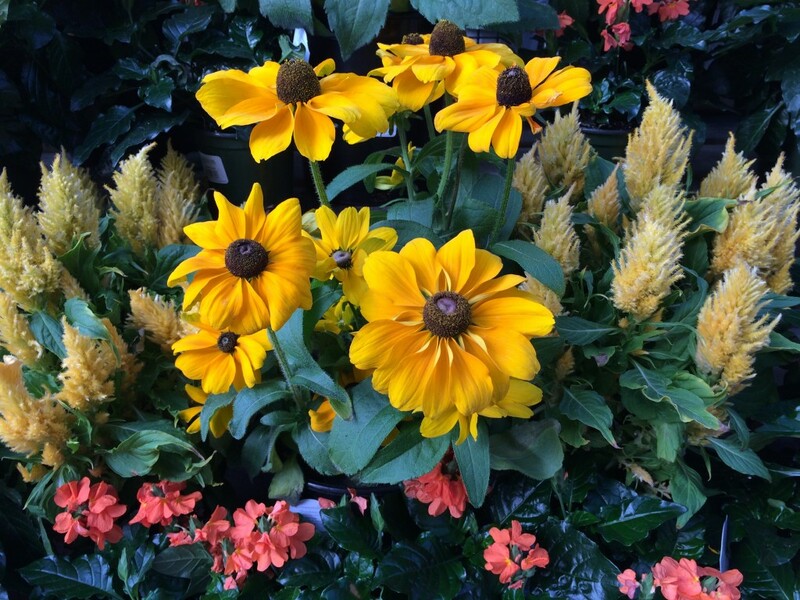 Rudbeckia- Plants (and flowers!) can be mammoth or miniscule depending on variety. ‘Toto’ reaches a pint-sized 1’ in height and bronzed ‘Autumn Colors’ will reach 2+’. Also in the tall group are ‘Indian Summer’ and ‘Prairie Sun’. ‘Goldsturm’ has smaller flowers but a ton of them. Ornamental Grasses- Easy fillers that come in a range of tones. Provide structure and overall form for the combination. Remember to pull out and plant perennials in the ground if you would like to have them come back next spring- plants are less likely to overwinter successfully in containers. Planning for continuing color through the season is one of the most challenging aspects of gardening. Planting bulbs in the fall is one of the best ways to begin the succession of bloom that can begin as early February depending on the weather. Imagine having flowers to admire while winter is still on the calendar. Snowdrops and early crocus are usually the first cheerful reminders that spring is on the way. 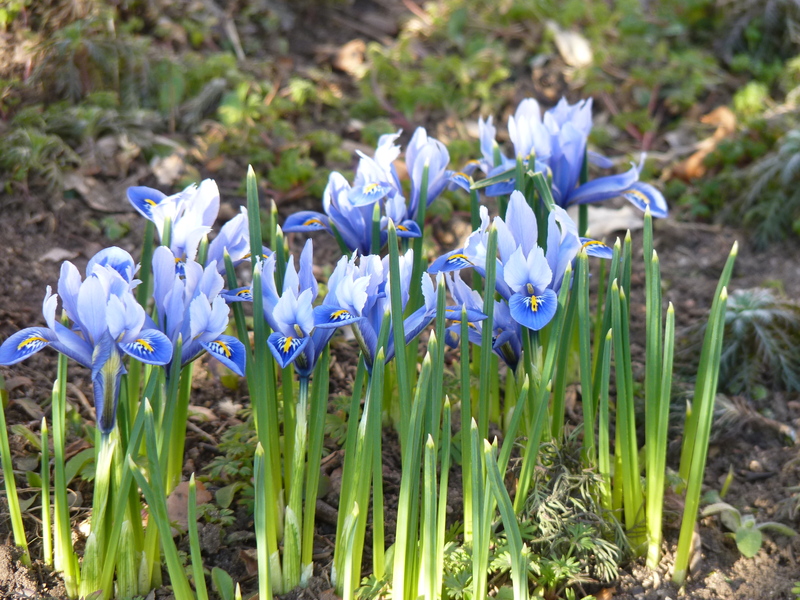 They are succeeded in the following weeks by many of the other minor bulbs including Iris reticulata, striped squill and the early flowering botanical tulips. 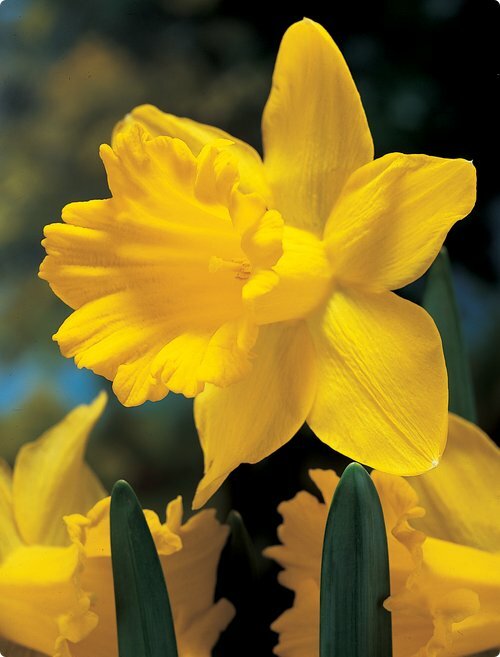 For the best display of these early bulbs plant them in groups of 20 to 50. Daffodils and tulips are the focus during the weeks of high spring. There is always room to tuck in new varieties that will provide pleasure for years to come. You will find early, mid-season and late varieties of tulips and daffodils, so be sure to plant some of each. 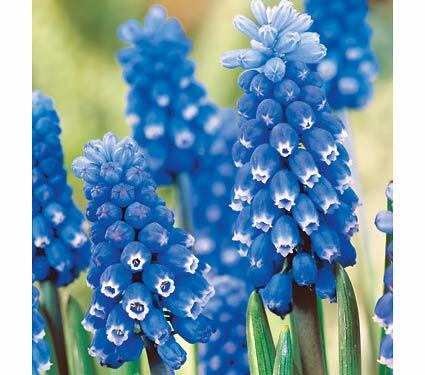 Other spring flowering bulbs to consider are hyacinths, alliums and frittilarias for their unique flowers. The alliums (ornamental onions) will continue flowering into the summer and develop interesting seed heads for additional interest. The Asiatic and oriental lilies are the stars of the summer gardens with their bright, jewel-toned flowers and elegant foliage. 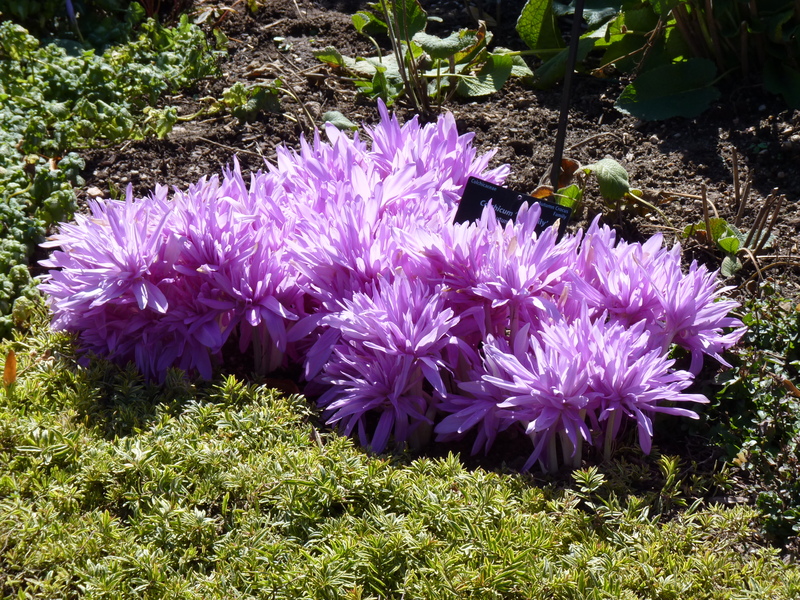 As temperatures cool and the colors of fall return the autumn crocus and colchicum bring a surprising finale of rich color to the garden. Bulbs are packages of promise for gardeners. The rewards arrive as each of the packages opens and flowers, each to its season. Plant bulbs this fall for next years color and for future years as well. What’s in Store for Spring 2015? 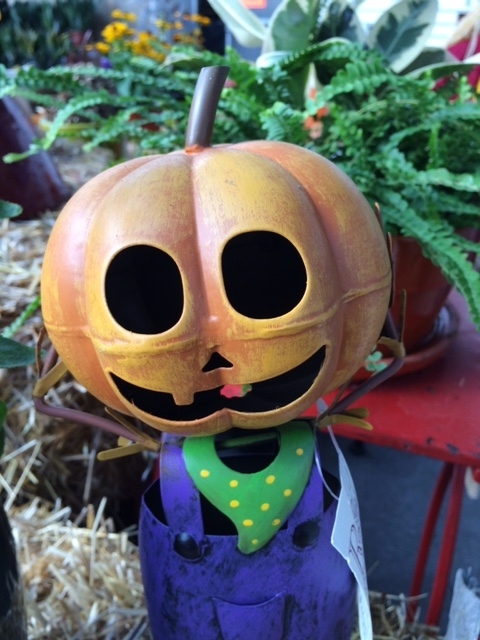 If you’ve ever visited the garden center this time of year, you know you can find plenty of personal assistance. We feel a bit like the Maytag repairman at times. While the surface looks vastly more calm than it does in May, the undercurrent is moving swiftly to meet deadlines for planning and ordering seeds, cuttings, tubers, bulbs and corms for 2015. We attend trade shows and visit several trial gardens during this time of year. 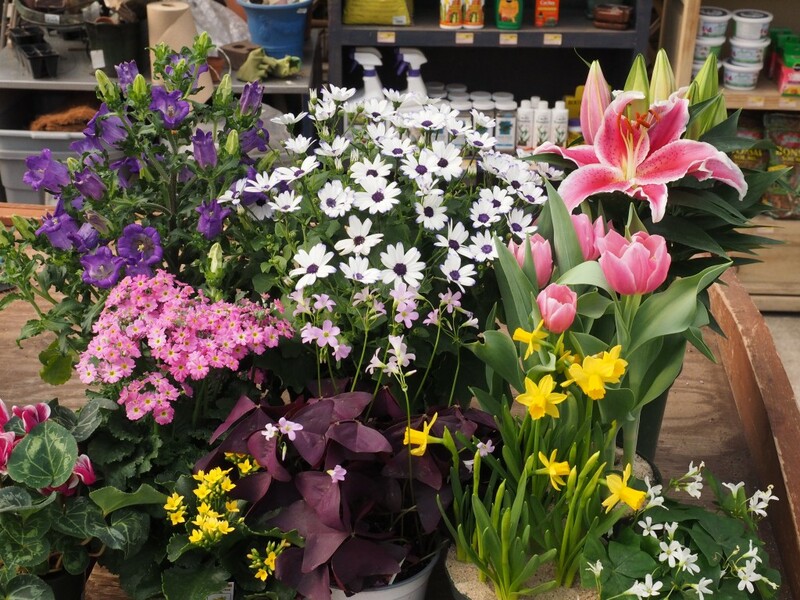 They are a vital part of the process of providing you with the best plants and gardening products available. One of the great joys of late summer is the opportunity to visit the annual trial gardens. Growers and plant propagators send countless rooted cuttings and seed samples to the College of Agricultural Sciences at CSU. Dr. Klett, with his team of students and Master Gardeners go to work growing these samples so we can see how they perform in our Colorado climate. Universities and many businesses across the country participate in such trials, providing the industry with an overall performance review of each of these new introductions. They are often planted, side by side, with plants considered to be the current top performers. This provides a direct comparison between varieties. Last week, many representatives from our industry made the annual pilgrimage to the trial gardens at CSU, to evaluate the plants that propagators hope we will add to our plant production for spring of 2015. What do we look for in a plant? I suppose it’s something like judging a dog show. We look for the best examples of what that type of plant should be in the garden. We look for qualities that indicate it will be a good performer in our high plains climate and those that suggest they will do well at higher elevations, too. It’s not easy to be quite that selective, sometimes. There are so many pretty plants, it takes a bit of self discipline to avoid distraction from our purpose. Next year may very well be the “Year of the Petunia”. Some years we see a concentration of new introductions of one particular plant or another. 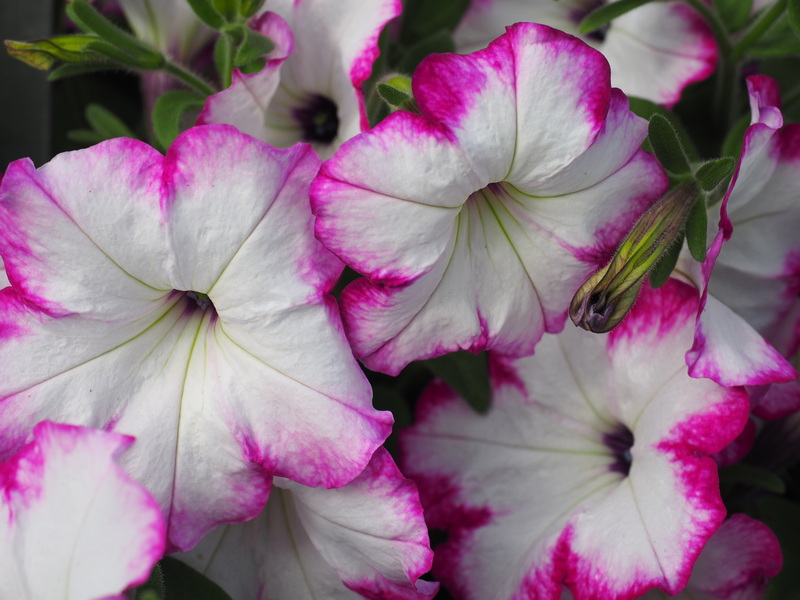 2015 promises to provide us with some incredible new petunias. There are more new petunias than I could count. Below is just one of the more promising varieties. 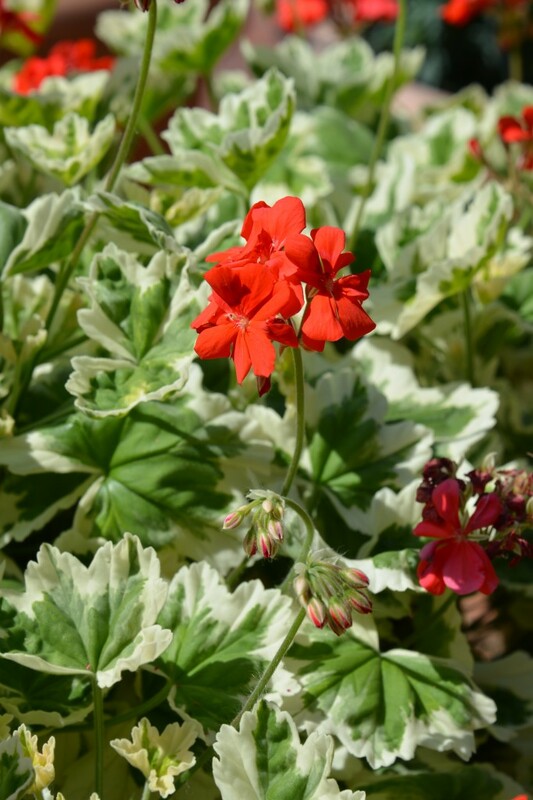 Geranium Glitterati Ice Queen is one of the best new plants for 2015. It’s stunningly bright white and green foliage is a standout on its own. The bright red blooms are the icing on the cake, or geranium, in this case. Variegated geraniums of old weren’t the most prolific bloomers but Ice Queen is the polar opposite, producing scads of bold blooms. 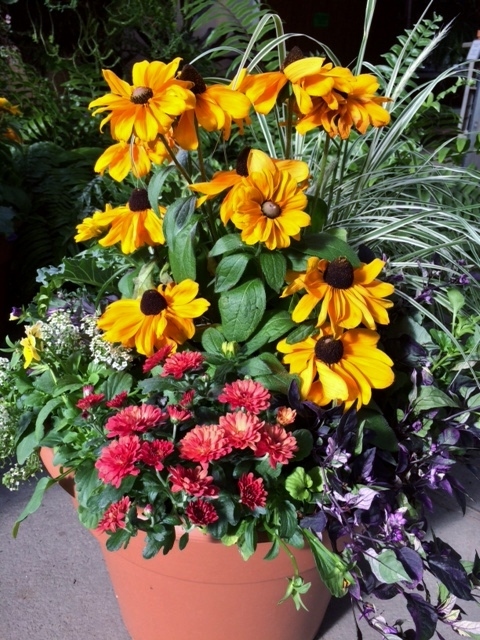 It’s spreading habit makes it an excellent choice for container gardens, larger hanging baskets and wherever you may need substantial coverage in border plantings. 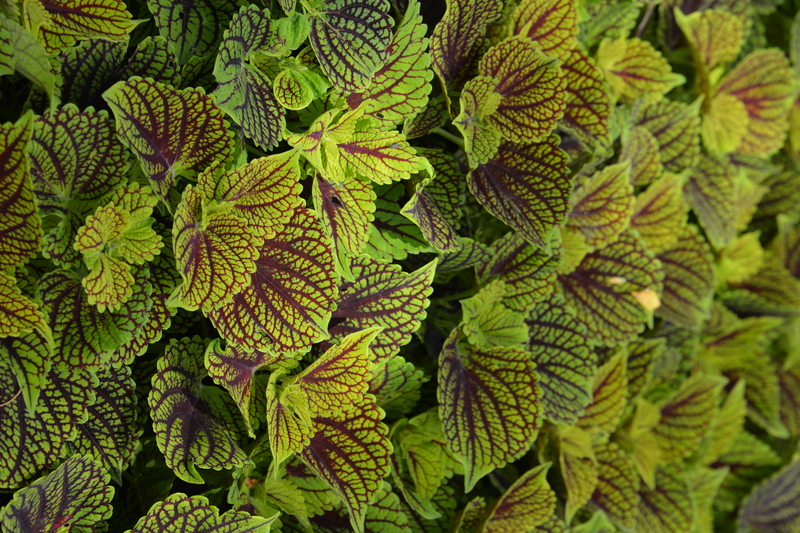 Coleus are a favorite, here at Echter’s. We’re always on the hunt for new, beautiful foliage to dress up the garden. 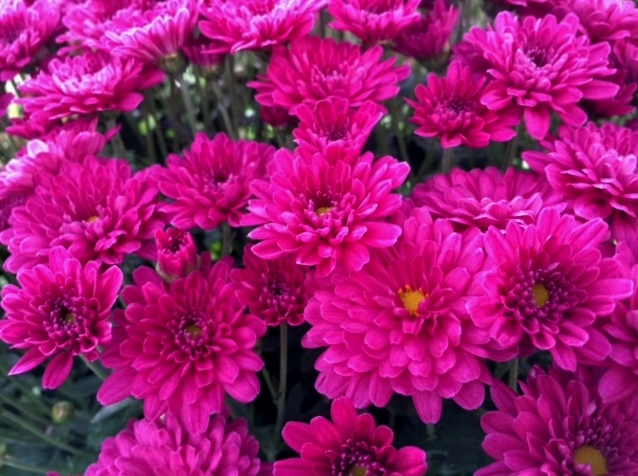 We look for sturdy stems, the ability to adapt from shade to partial sun, firm foliage that doesn’t flop in the first breeze, colors that don’t fade and resistance to disease. Coleosaurus is one of the more exciting introductions for 2015. 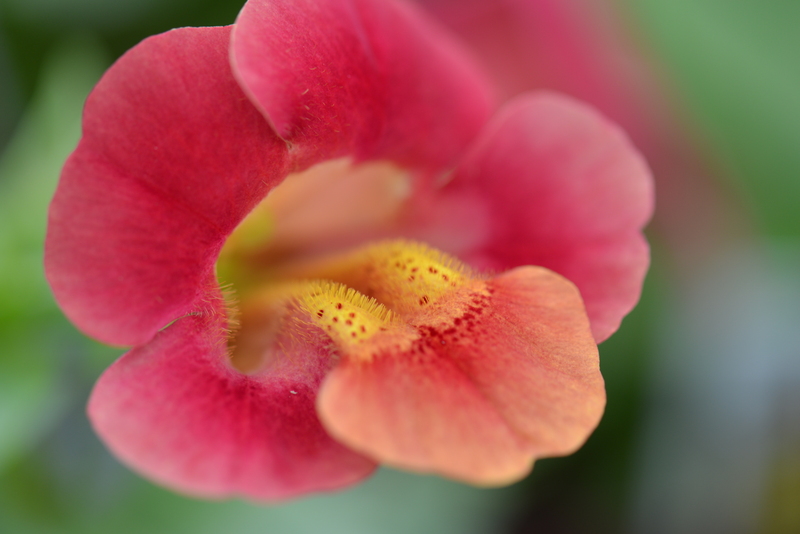 If you’ve been a longtime fan of impatiens, you probably already know about the disease that has been a bit of a challenge to them in recent years. Impatiens Downy Mildew (IDM) can defoliate a group of Busy Lizzys within a week. IDM affects only the traditional Impatiens walleriana. It does not affect New Guinea Impatiens. 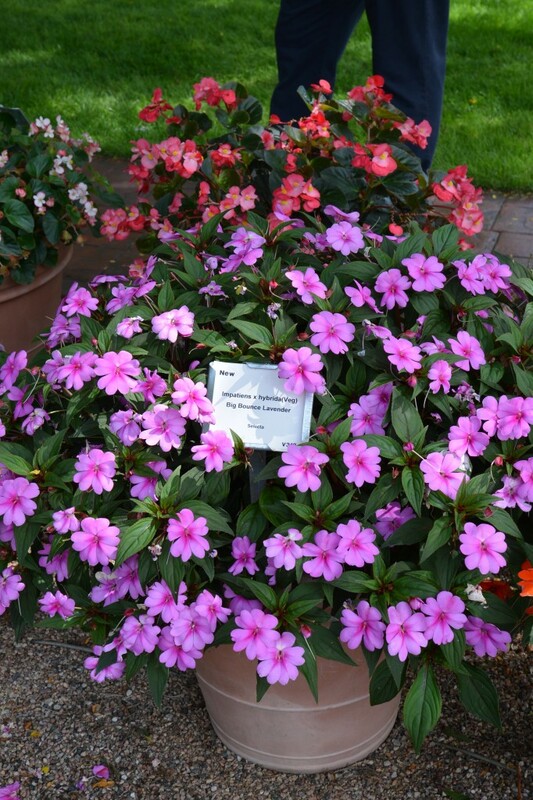 There are treatments that can be used if you want to stick to the traditional impatiens, but it may be worth giving some of the New Guinea types a try. 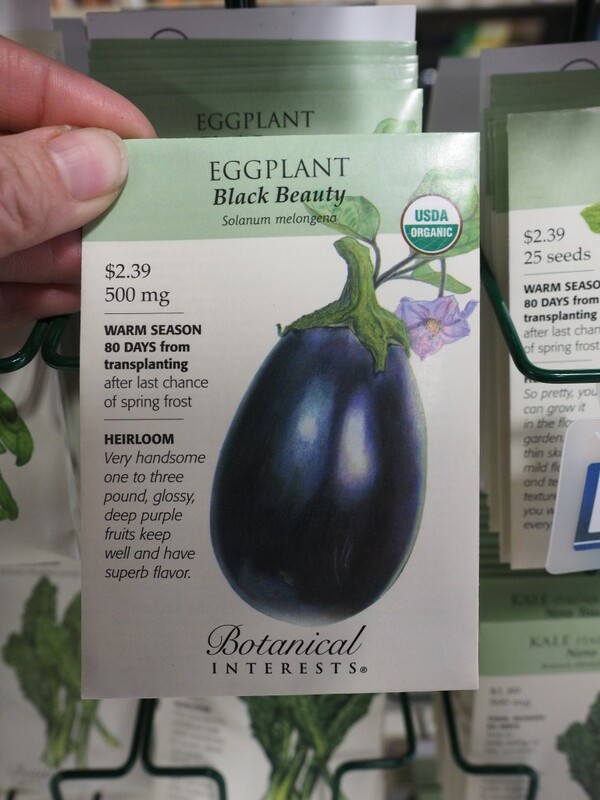 Since the risk of IDM became apparent, plant breeders have been racing to provide us with alternatives. Bounce and Big Bounce impatiens are the result of such efforts. 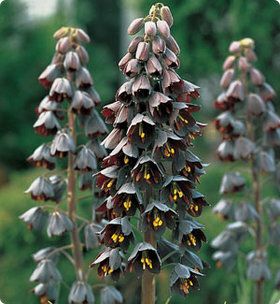 They provide the flower count of traditional wallerianas while being resistant to IDM. Look for some stunning new verbenas next season, too. 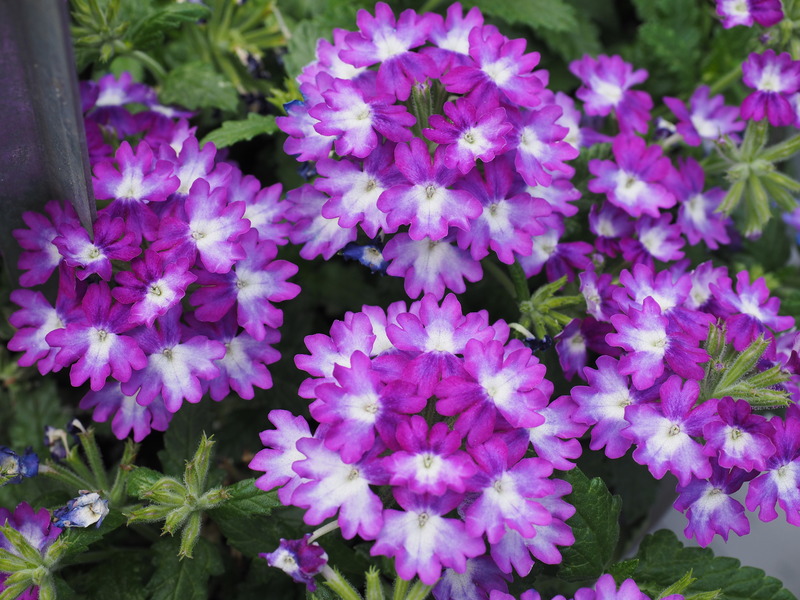 Newer introductions have amazingly vivid colors and large bloom clusters. 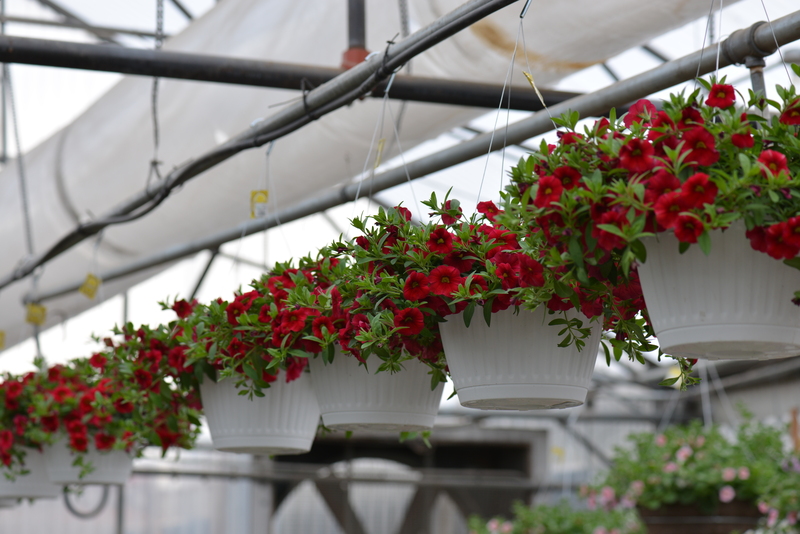 We look for vivid colors that don’t fade, sturdy stems that don’t break easily in the wind, habits that make them good companions in hanging baskets and planters, and disease resistance. 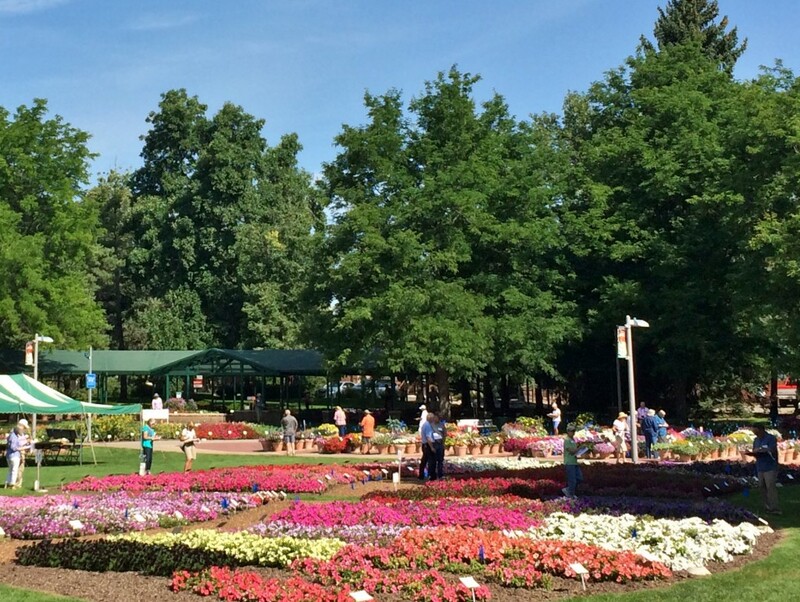 The trial gardens at CSU are open to the public and we encourage you to visit there sometime. They can be found at 1401 Remington Street in Fort Collins. Once the heat of summer comes along it seems every aphid, spider mite, and leaf miner and thrips pay a visit to my garden. In the case of most garden pests, high summer temperatures create the perfect environment for rapid reproduction. Learning to identify the what creatures are munching on the garden plants is the key to gaining control. Once identified, we can learn a little about their life cycle so we can choose the best method of control. Many garden pests can be controlled with a garden hose and a strong spray nozzle. If we scout out the garden regularly, chances are we can find them before they become a serious infestation. Most pesticides (organic, natural, or otherwise) are effective on specific pests. There isn’t a single pesticide that is effective on every garden pest, which is all the more reason we really need to identify what’s chewing away on our plants in order to form a responsible plan of attack. After all, no one wants to spray anything willy-nilly through their garden. Not only would that be a waste of time, energy and money, it may also pose a risk to those beneficial insects we actually need in our gardens. 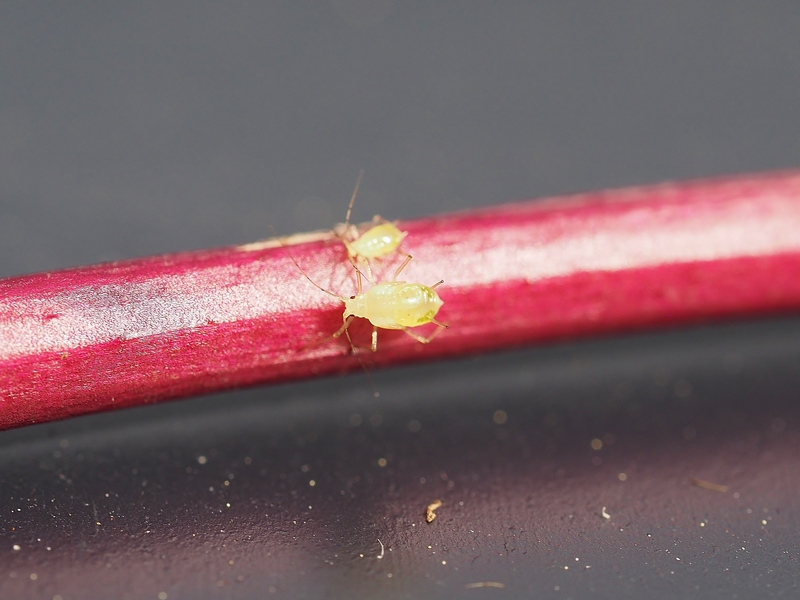 Thrips are super tiny insects that aren’t easily seen without magnifying lens. Most often we see Western Flower Thrips in the garden. They are slender, tan insects, about .2 mm long. They are so tiny, we usually see the damage to our plants long before we notice the insects. They are notoriously difficult to treat because they often feed on the tender tissue inside buds or the folds of immature foliage. They are sucking insects so they often leave buds and leaves deformed and scarred. 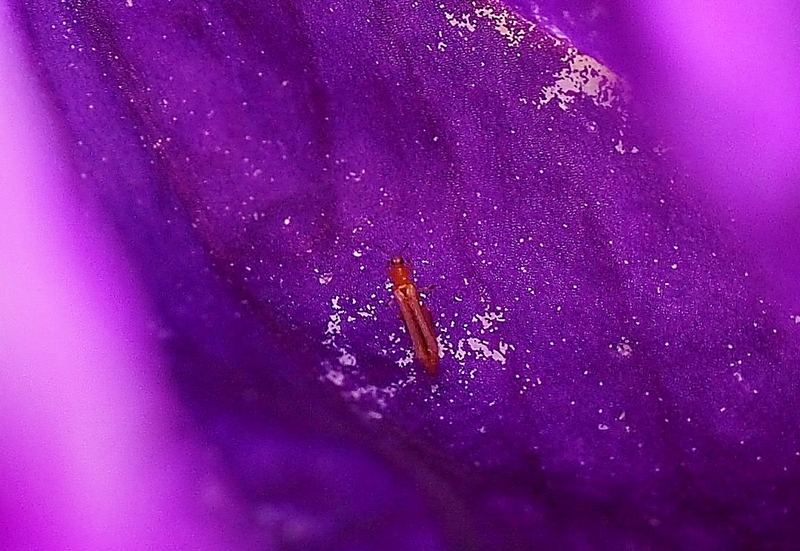 Thrips are particularly attracted to blue flowers. Knowing this, I usually plant a few dark blue petunias and use them as sentinel plants. Once I start to see stippling on the flowers and areas that have clearly lost their color due to tissue damage, I can bet they have decided to make a home in my flowers. A strong spray of water can drown them. If they persist, try using an insecticidal soap, neem oil or pyrethrin spray. Thrips are also known to spread tomato spotted wilt virus, spreading it from plant to plant as they feed. Below you can see the damage and the thrips. Aphids are probably the most common and devastating garden pest. They may be green, red or black. They are plump, soft bodied, little insects and we can usually identify them by their cornicles (tubes that sort of look like horns protruding from their abdomen). 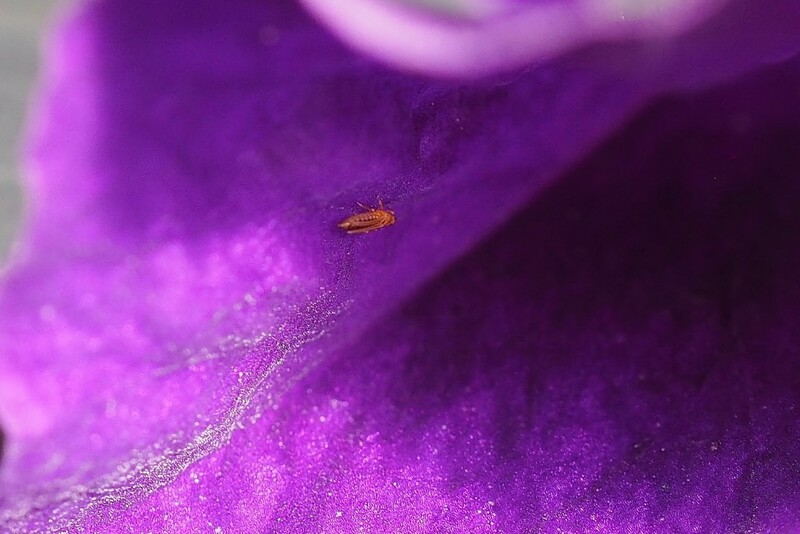 Aphids are also sap sucking insects that leave our plants with deformed, stunted buds, blooms and leaves, reducing productivity of vegetables. Aphids are also capable of spreading many plant viruses. They are, however, one of the easiest insects to control when they are found early. Hosing off plants with a strong stream of water will go a long way toward eliminating aphids. Neem oil and pyrethrins are very effective treatments, too. Aphids can build up a tolerance to pesticides with each generation, so alternate whatever you use to insure the best results. We often see spider mites after we’ve noticed their webs. These teeny-tiny insects can make foliage appear gray-green and speckled. We see the damage primarily on the back side of the leaves. The top of the leaves may appear a bit discolored, faded and the speckling may be obvious. They can be hosed off with a strong stream of water. They may also be treated with insecticidal soap, neem oil, or pyrethroids. 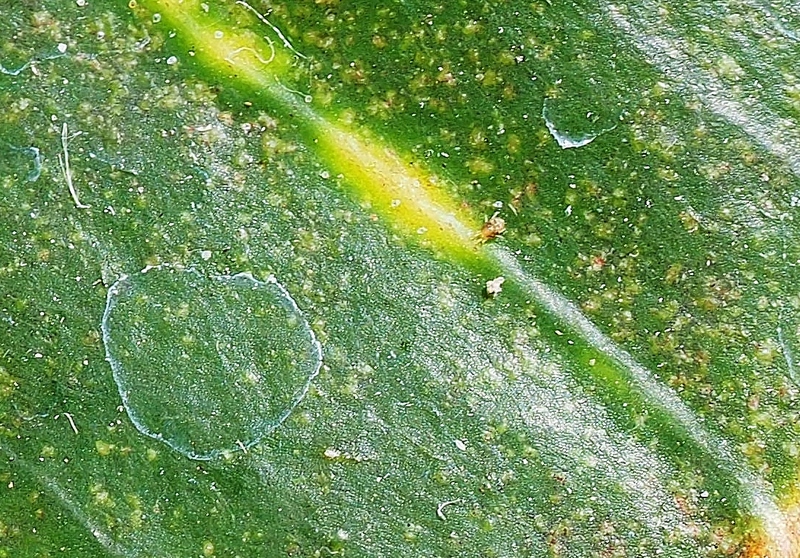 Spider Mite on Croton leaf, pictured below. Spider mite damage to Mandevilla pictured below. It’s important to note that any chemical, organic or otherwise, should be used according to the directions on the label. All chemicals are expected follow specific protocols established by the EPA. In other words, the label is the law and there is no substitute for reading the fine print. Don’t spray on a windy day when the chemical may drift onto other people, plants, wildlife, or toward beneficial insects. Water the day before you spray and spray in the early morning or late evening hours. This helps reduce the risk of damage to your plants from the spray. Be sure to wear gloves and the appropriate protective gear when handling any chemical. 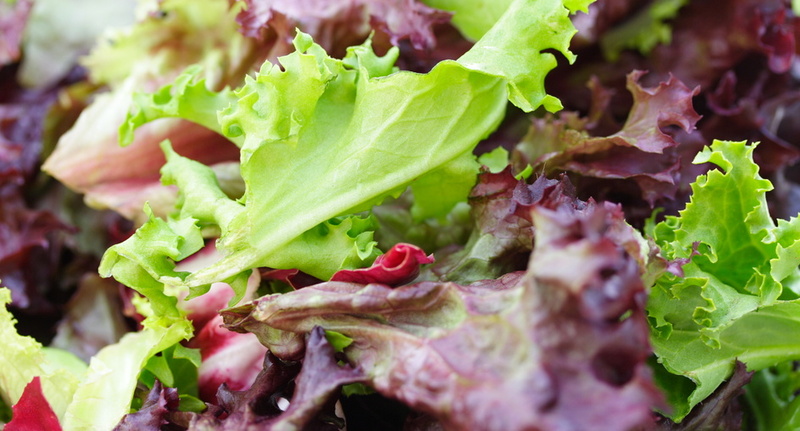 Late summer is a great time to plant fresh crops of lettuce, spinach, broccoli, and cauliflower. Starting them from seed in late July and early August allows us to grow them into the fall. Cole crop vegetables thrive as the temperatures begin to cool in September and October, taking frost in stride. Most short season root crops will do the same. It’s a good idea to keep a frost blanket handy, though. Frost blankets will prevent your late season crops from suffering damage in the event of an early hard freeze. What can you grow? There’s quite a list, but one of the important things to consider is the number of days the crop needs to reach maturity. This is usually on the front of the seed packet. Stick to plants that need less than 75 days to mature for late crops. How do you know when to start fall crops? Count back the number of days the crop needs to mature, from the average first frost date. In Denver, that date is October 11. So if your lettuce takes 60 days to mature, count back from October 11th and seed them on August 12th. If you don’t have a calendar handy, this website is easy way to calculate dates; http://www.convertunits.com/dates. 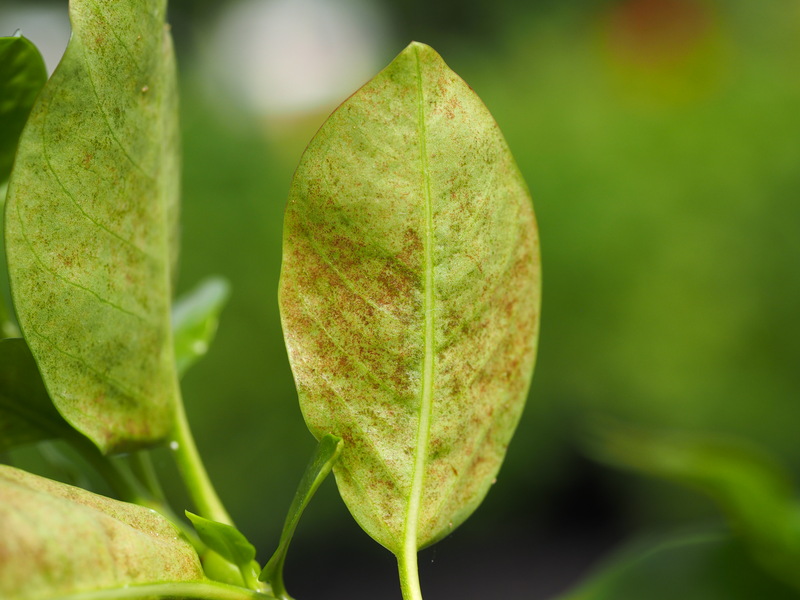 Choose varieties that are less susceptible to powdery mildew for fall gardens. Cool nights and moisture condensation on the foliage is all the spores need to wreak havoc on your vegetables. Planting crops a week apart, successively, will extend harvest well into the fall. Enjoy!